Artist Anthony Petrie thinks the pop culture art scene has gotten a little stale. So many rehashes of the same ideas, same properties, with the same old techniques. This is art! Do something different! Be bold! And with his upcoming solo show—and a little help from the Predator—he’s doing just that. The show is called chARTs 2, a follow-up to the 2015 show where Petrie took some of the most famous pop culture properties ever and turned them into all manner of maps, infographics and more. Among them was an iconic Jaws poster/nautical chart that became so popular he knew he had to raise the bar. And here are a few detail shots what happens after. 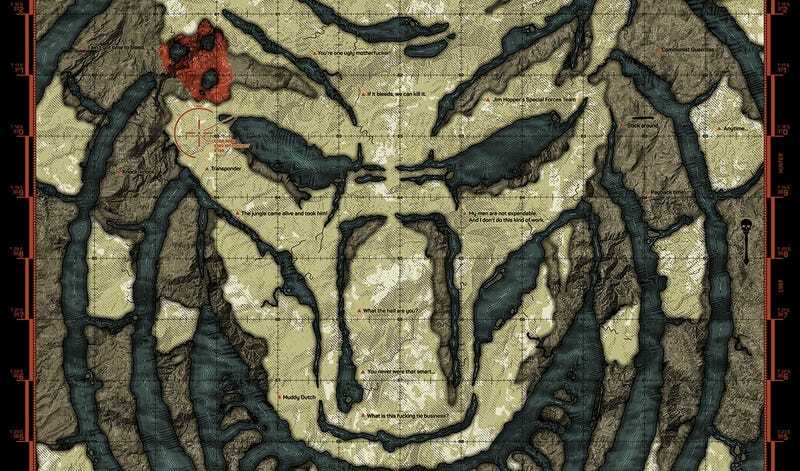 Again, one touch—and the entire poster changes colors making the Predator blend into the background, just like in the movie. It also highlights what Petrie was going for not just with this poster, but the entire show. Besides Predator, Petrie has posters for Ferris Bueller’s Day Off, The Grand Budapest Hotel, Rocky, and several other movies. Then there’s these: First up is Chartzilla (you can probably guess the property). This is Flight Plans, for Pixar’s Up. And this is Roamer Road Map, inspired by The Walking Dead. There are more pieces in the show too, and you can see them all when it opens at Gallery 1988 West at 7:00 pm PT, September 3. The whole show will then go online Sunday, September 4; follow @Galleries1988 on Twitter to be notified when it’s available for online perusing.